The School Lunch Service is carefully prepared by Susan Owens-Jones, our chef, and subsidised by Ceredigion County Council. All our meals are made at school on a daily basis, are nutritionally balanced and prepared using fresh, healthy ingredients. There is a blackboard by the hall which shows the menu for the week. Vegetarian/vegan diets and allergies are always catered for, please let us know what your child's requirements are. The cost per day is £2.50 per child, and is payable in cash or cheque (made out to Ceredigion County Council). 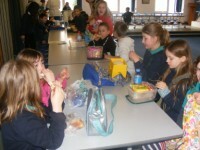 Ms Louise Davies collects the dinner money and is in the school office on Monday and Friday mornings. Free school meals are available to eligible families, please visit Ceredigion County Council free meals webpage here to see if you are eligible. You can download and print the application form directly from the Council website. Only during school term time we offer this unique service. If you are interested please contact the school (01570) 493 424 before 9.30am. Cost of meal £4.35 a day. This offer is only available to senior citiizens. You are welcome to come to the school to eat dinner if you wish. Packed lunches from home are required to be in a suitable container, and drinks must be in cartons or plastic bottles - no glass! They are put on the trolley in the hall in the morning, ready for lunch. If there is anything that needs to go in the fridge, let your child's teacher know. We participate in the Healthy Schools initiative, so we strongly encourage packed lunches to be made from healthy ingredients, and to limit the amount of sugary drinks and snacks. A diet rich in nutrients with low or no sugar and refined foods has been shown to improve a child's concentration and wellbeing! As part of our commitment to being a Healthy School we encourage children to eat a healthy snack at playtimes. You may send a piece of fruit into school with your child, or money to buy something from the organic fruit trolley which is run by Year 6 pupils. Fruit is 25p each and occasionally there is a fruit salad for 50p. The profit is banked in the Bwrdd y Plant account. Free milk is provided in the morning for the younger children. Please let us know if your child does not drink milk, and arrange to provide an alternative. Children in the Nursery and Derbyn have a picnic in the afternoon. Please give your child a drink and fruit or a savoury snack to bring to school for this purpose.